Designers Matt Johnson and Jason Logan cite “Prism Cloud” as an example of their aim to use sustainable technologies as tools for creating transformative experiences. 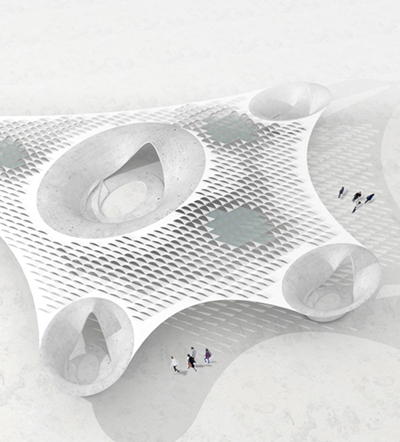 As colleagues at the University of Houston College of Architecture, they have collaborated on this solar energy entrant in the Land Art Generator Initiative with several objectives in mind. “Our goal was to make a project that would be simple to install, compelling as an experiential space, and that would generate energy without appearing explicitly infrastructural,” explains Johnson. One of the major criticisms leveled against any large-scale installation of solar panels is the sheer size of the footprint. The monumental solar field proposed for Deming, New Mexico, for example, will cover more than 3,000 acres of surface area upon its completion. So while there are environmental benefits to be gained from any photovoltaic-based source of electricity, “Prism Cloud” offers a lighter touch: it consists of malleable, thin-film solar cells strung together by cable and suspended cloud-like above the ground as a canopy, held aloft only by a series of structural concrete piers (or oases). The lightness of the physical footprint atop the earth’s surface makes this an appealing proposal, but it is a different form of light altogether that turns this energy generator into a genuine piece of land art.